I thought the solution should be something to inspire the generation that are coming after us. 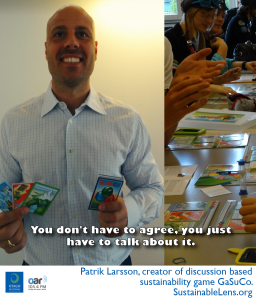 Patrik Larrson is creator of GaSuCo “Gaming in Sustainability through Communication”. We talk about his motivations and the role of discussion in sustainability. 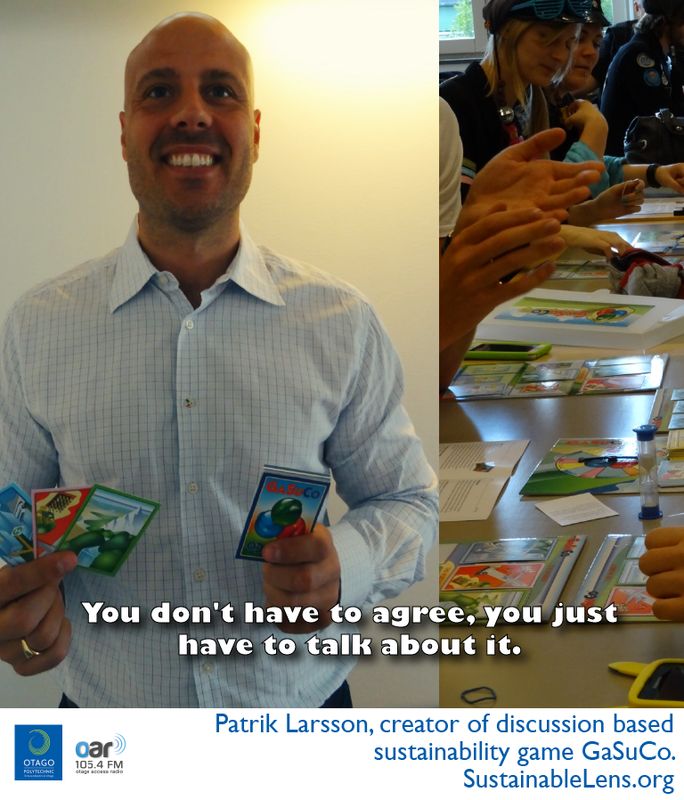 This conversation was recorded after we talked after we played the game with Elina Eriksson and Daniel Pargman‘s Masters course in Sustainable Media Technology at KTH in Stockholm (flickr set). I was challenged (in my Masters) to think what is the next big thing? I thought the solution shouldn’t be to invent something for the future, I thought the solution should be something to inspire the generation that are coming after us. Interaction and discussion is a much better way of sharing knowledge than just looking something up. The questions are designed for discussion…both viewpoints are correct..there are no right or wrong answers. The questions are designed to be tough and hard and difficult, but however you approach a subject it is still correct. You bring other peoples’ knowledge with you – to create your own base of knowledge. The questions are written in a way that they are supposed to be challenging. It’s no fun if you always know what the answer is. If you always know the answer, you don’t progress, you don’t get challenged in your way of thinking. When discussing things with no actual answers you get all different kinds of viewpoints. There’s a discussion question “Is it OK to buy second hand Christmas gifts?” and this can be followed in the discussion with “…and do you?”. There is a difference between acting and saying, we also highlight that,. it is easy to have a viewpoint of the correct thing, but when you discuss it these differences become clear. You’re entitled to your opinion, but you have to motivate your answer. You have to be able to stand up for what you think. As long as you can do that, you’re entitled to whatever opinion you want. I’m not here to change anybody to think what I think, I just want to engage people in talking about it. I cannot force someone to think what I think. But this is a way of helping them discuss it, and understanding themselves that we cannot continue business as usual. The main thing is that people play the game and understand that there are different ways of looking at how we are living, and talk about it. People have this feeling that someone, somewhere is going to make a change. That itself has to change. Motivation: understanding that we are all different but cannot continue what we’ve been doing, this is my way of contributing to that change. Activist: I’m just a regular guy trying to make education more fun. Challenges: High school, and then try for a computer version without losing the core of interaction.